Kyle Larson goes airborne at the finish of the NASCAR Nationwide Series DRIVE4COPD 300 at Daytona International Speedway. The last thing you want to do when you go to the racetrack is end up in the garage with a torn up race car. Unfortunately for most competitors in NASCAR, at some point in the lengthy season you’re going to find yourself caught up in an incident. While this wreck was not as spectacular as some others, the strange impact of the two cars and the ensuing damage became a focus point of the new Gen-6 car’s design. 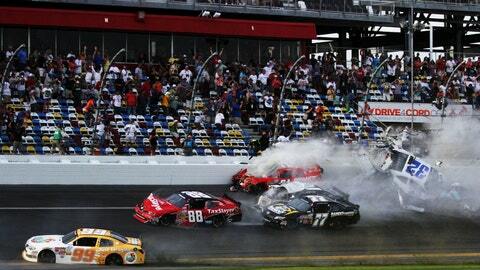 When Busch lost control of his car and slid down the track, Logano had no place to go. The two made hard contact nearly head-on. Daytona, pack racing, under the lights. What could go wrong? When the white flag flew on the Coke Zero 400, there was little doubt the next 2.5-miles would be tense. As the field screamed through the first corner, Carl Edwards was tagged from behind, triggering a multi-car wreck. However, NASCAR opted to keep the race going as the rest of the field jockeyed for position headed to the checkered flag. As Jimmie Johnson led the field through the tri-oval, Danica Patrick and David Gilliland made contact, setting off another wreck and sending a shower of sparks and debris sliding across the start-finish line. Much like Daytona, it should be no surprise to see Talladega Superspeedway on this list. The third wreck on this came during the May Sprint Cup Series race, when Ricky Stenhouse Jr. tried to move to the outside of J.J. Yeley heading into Turn 3. The gap closed and chaos ensued. Yeley’s car shot across the track and into the right rear of Kurt Busch’s No. 78, sending it tumbling down the track until landing on the hood of Ryan Newman’s No. 39. Whenever the NASCAR Camping World Truck Series hits the high banks of Talladega Superspeedway, you’re always in for a wild ride. That was certainly the case on the final lap of the October event, as two massive wrecks took place coming through the tri-oval. Through the smoke and sparks, only the leader Matt Crafton and David Starr, who was running at the back of the pack, made it through with no damage. Miguel Paludo took the most spectacular ride, flipping and sliding across the track on his roof before flipping back on all four wheels. Kyle Busch also took a massive hit to the inside wall, a wall with no SAFER barrier protecting the drivers. Eliminated from Sprint Cup through a series of rule changes, the two-car tandem draft is alive and well on the superspeedways in the Nationwide Series. That was evident all throughout the season-opening Drive4COPD 300, which saw 34 lead changes among 20 different drivers. When the white flag flew, it was still pretty much anyone’s race. Coming off the final corner, Brad Keselowski made a move to the outside of Regan Smith, who threw a block. That triggered a massive wreck as the field approached the checkered flag. During the incident, Kyle Larson’s car became airborne, flew into the fencing and was thrown back across the track. The impact punctured the fencing at a cross-over gate, with Larson’s engine and left front tire lodged into the catchfence. His right front tire assembly, along with other debris from the car and the fence was thrown into the crowd. Up to 28 people in the stands were injured, two critically. Remarkably, the fencing was repaired in time for Sunday’s Daytona 500. As a result of the incident, NASCAR worked with tracks to help reinforce fencing, especially in the area of cross-over gates.